This tutorial provides you with a foundation for working with sharing in Adobe Photoshop Elements. 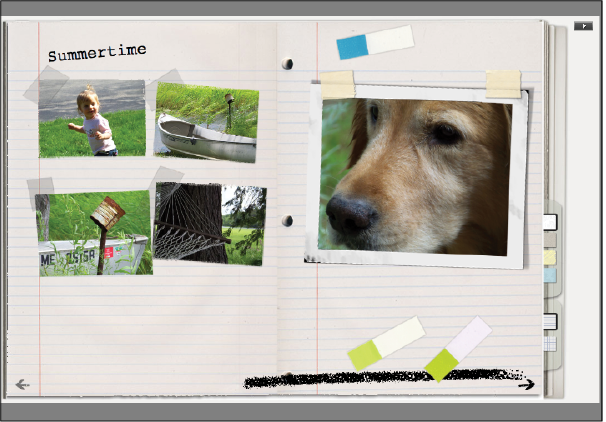 It is the sixth lesson in the Adobe Photoshop Elements 10 Digital Classroom book. Photoshop Elements makes it easy for you to share and print your images. You can post photos online, or e-mail them to family and friends, have photos professionally printed by online providers, or print them at your convenience on your home printer. Within the Photoshop Elements Organizer: You will work with several files from the Lessons folder in this lesson. Make sure that you have downloaded the Lessons folder onto your hard–drive. In order to access these files in the Organizer, you need to import them. See “Adding files and folders to the Organizer” located in Lesson 1. Within the Photoshop Elements Editor: The Photoshop Elements Editor defaults to the last panel layout that you used. Before starting, make sure your tools and panels are consistent with the examples presented in these lessons by resetting the panel locations. Do this by choosing Window > Reset Panels or by pressing the Reset panels button ( ) in the Options bar. If you’re currently viewing the welcome screen, press the Organize button ( ) to enter the Organizer workspace. The Photoshop Elements welcome screen. After you’ve imported, organized, and edited photos on your desktop, you’ll want to share them with family and friends. With Photoshop Elements, you can share photos with others through an interactive online album, via Facebook, Flickr, SmugMug, or through e-mail that you send. You can also print photos on your own printer, order professionally printed photos, or put your photos on a CD or DVD. In this exercise, you’ll learn a variety of ways to share photos from the Organizer. In the Editor, you can also share photos that you’ve edited or have open in the Project Bin. The Online Album Wizard provides step-by-step guidance for adding, deleting, and arranging photos, choosing a layout template, and sharing your files. 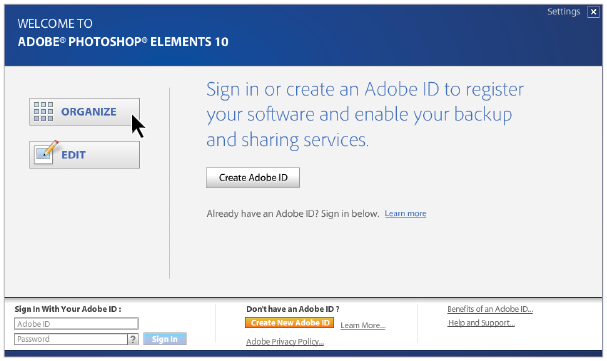 Later in this exercise, you will be prompted to sign in with your Adobe ID. If you wish, you can sign in now by pressing the Sign In option at the top of the Organizer or Editor workspace, or even from the Welcome Screen. 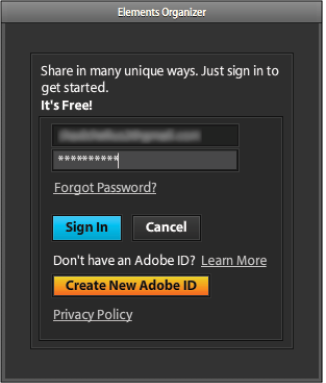 If you do not have an Adobe ID, press the Join Now button and create one in order to proceed with the exercise. An Adobe ID is free and only takes a few minutes to set up. The Online Album Wizard lets you arrange photos. It does not allow you to edit them. 1 You’ll be sharing photos from the Photos to Share folder within the Lessons folder. These images were already imported into the Organizer when you added the Lessons folder in Lesson 1, see “Adding files and folders to the Organizer,” if you skipped this step. Type share into the search text field at the upper-left of the Organizer workspace to isolate the sixteen images for this lesson. 2 In the Organizer, click to select 10 photos that you’d like to include in your online album. You can use the Ctrl key (Windows) or Command key (Mac OS) to select multiple items. 3 Click the Share tab to select the way you want to share photos. Click the Share tab to choose how you want to share photos. 4 Click Online Album to open the Online Album Wizard in the Organizer and click the Create New Album radio button. 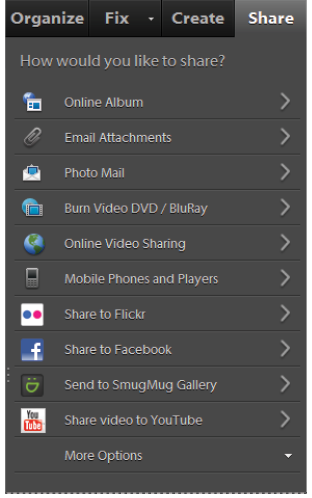 Photoshop.com allows you to share your albums online. Export to Hard Disk allows you to save the files locally on your hard drive. 6 Choose Photoshop.com and press Next. 7 If you work with album categories, choose the appropriate category from the drop-down menu. Use the Online Album Wizard to customize your online album. 8 Type Summertime in the Album Name text field. 9 Select two more photos in the Organizer and then press the Add items selected in Media Browser button ( ). You can also drag photos from the Organizer into the Items area. 10 Select one of the photos you just added to the Items area and then press the Remove selected items button ( ) to remove it from the album. 11 Drag the thumbnails to arrange them in the order that you want them to appear. When you place your cursor over a thumbnail you will see a hand icon ( ). As you drag the thumbnail, the other thumbnails shift slightly to indicate the placement of the one you are dragging. 12 Press the Sharing tab at the top of the panel. Photoshop Elements builds an album preview for you. Photoshop Elements builds an album preview for you. 13 Double-click the different templates available at the top of the screen. 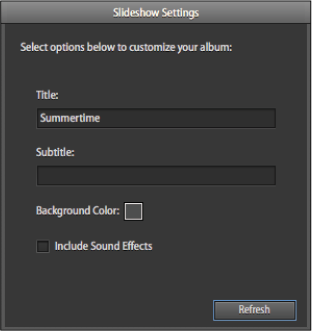 As you choose different templates, a Slideshow Settings window may appear in the main slideshow window providing options for the selected template. Enter a Title and Subtitle of your choice. If available, click the Include Sound Effects checkbox if you’d like sound effects played in your slideshow. You can also change the background color from this window. 14 When you are finished entering information into the Slideshow Settings window, you can press the Show/Hide Slideshow settings button ( ) located above the template thumbnails to hide the window. 15 Click the Share to Photoshop.com checkbox. If you haven’t already signed in with your Adobe ID, you will be prompted to sign in at this time. If you do not have an Adobe ID, you will need to press the Create New Adobe ID button and create one in order to proceed with the exercise. As you go through the steps, Elements may provide a URL for you. Jot this down so you can recall it later.